Available in three body types and four cutter faces, the 3D Reamer/Stabilizer Model 2020 is a “workhorse tool” proven in the toughest drilling. The Near-Bit, 3-Point is furnished box-down for make-up with the drill bit and ensures the hole diameter is held to full gauge even as the bit wears. This eliminates reaming part of the way when a new bit is tripped downhole. The Near-Bit, 6-Point has two sets of cutters staggered in relationship to each other for extra reaming capacity. This type helps prevent sharp deviations in packed hole assemblies, and is ideal for conditioning the hole prior to running casing. The String, 3- Point type is provided with pin-down and box up for placement with in the drill collar string. This type not only reams but also centres the drill collar string for faster bit penetration, more positive deviation control, and helps avoid differential sticking. 3D’s one-piece weldless body construction utilizes a proprietary chrome-moly alloy that is exceedingly strong. After machining, the body is fully heat-treated and historical records are kept on the metallurgy of all parts. The Model 2020 is available in body sizes for a reaming 20 hole sizes from 5 5/8” thru 28”. Custom options include 9-Point configuration, slabbing between cutter pockets for better annular flow, tungsten carbide hardfacing on wear surfaces of the cutter assembly bushings, and protective tungsten carbide “wear pads” welded to body between lower cutter bushings. Tungsten carbide inserts locked into cutter and used in conjunction with insert or button bits. All button cutters are plated internally with industrial chrome. Hard-faced spiral for hard formations which must be removed by crushing. Cutters are furnished with industrial chrome-plated pins. For hard formations requiring a cutter action. Cutters are furnished with industrial chrome-plated pins. For straight stabilization of the string without increasing torque. Cutters are furnished with industrial chrome-plated pins. 3D's cutter assembly is designed for extra rugged service, yet is easily redressed on the rig floor in just minutes without special tools. Reversible cutter pins may be rotated 180o when changing cutters, for longer wear. 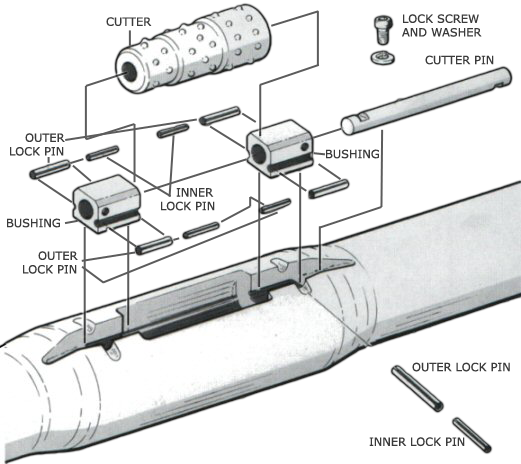 Simple Design - bushings and cutter pin are secured by double lock pins. There are few parts and redressing is routine.